If you want to prevent the aging process from reducing your muscle mass, then of course you first think of strength training and a diet with enough protein. In the second place you might also think of a diet that increases the concentration of butyrate in the blood. This is evident from an animal study that American cell biologists from the University of Texas published in 2015 in Aging Cell. The researchers gave a group of mice from their 16th month [a lab mouse is then middle aged] until their 24th month of life [a lab mouse is then elderly] feed that consisted of 5 percent of sodium butyrate. A control group of mice received standard chow. For people, such a supplementation scheme is risky. People who want to get more butyrate in their system are better off increasing the amount of dietary fiber in their diet. 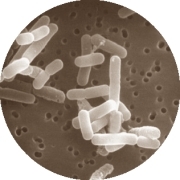 Probiotic organisms convert it into butyrate or other short chain fatty acids, such as acetate or propionate. Butyrate had no effect on the body weight of the mice, but on their body composition. The old mice that had been given butyrate had less fat mass but more fat-free mass than the old mice that had received feed without additives. The mice that had been given a standard diet lost 23 percent of the muscle mass in their hind legs between their 14th and 26th months of life. If the mice had been given butyrate by their feed, they lost only 12 percent of their muscle massa. The cells from 26-month-old mice [O] receiving butyrate [Bu diet] made as much TFAM and PGC-1 alpha as the cells from young mice [Y]. In the cells of 26-month-old mice with a standard diet [Ctrl diet] the production of TFAM and PGC-1-alpha had decreased. TFAM and PGC-1-alpha stimulate the production of mitochondria. In the case of young mice, however, butyrate had no positive effects. The researchers also saw that the oxygen consumption of the mice in the buyrate group was higher than in the other group. This means that the cells convert more nutrients into energy. In their article, the researchers start from the theory that butyrate causes these fascinating anti-aging processes by inhibiting histone deacetylases. As a result, aging muscle cells would continue to function longer. But, the researchers admit, perhaps the mechanism is a bit different. "We cannot rule out the possibility that butyrate exerts its effects independent of the inhibition of histone deacetylases", write the researchers. "Other than histone deacetylases inhibition, butyrate has two effects in the cell; it is a fatty acid that can be used as an energy source, and it can bind G-protein-coupled receptors that are involved in the resolution of inflammation in the gut. Whether these receptors have a function in skeletal muscle needs to be determined." "Our data suggest butyrate [...] could be used to treat age-related metabolic disease and sarcopenia." If you make pancakes by adding whey to your batter and replacing the flour with resistant starch, then according to sports scientists at Skidmore College in the US you'll have a kind of super-pancake. The probiotic also makes mice leaner. A product that the food industry has been using for years as a filler and gelling agent is, according to American researchers, a body recompositioning drug.